Take It Make It Challenge: All The Winners! Oh.My. Goodness.... you lot are amazing! 181 entries in our January Challenge! We are thrilled you like our new format, and we were amazed at the level of fabulous stamped art everyone shared. THANK YOU! So....the moment you've all been waiting for, the announcement of the winners! As you will remember, from now on we will have TWO winners from each challenge, the Design Winner and the randomly selected Prize Winner. First up, I am thrilled to announce our Design Winner..
Congratulations Hermine! 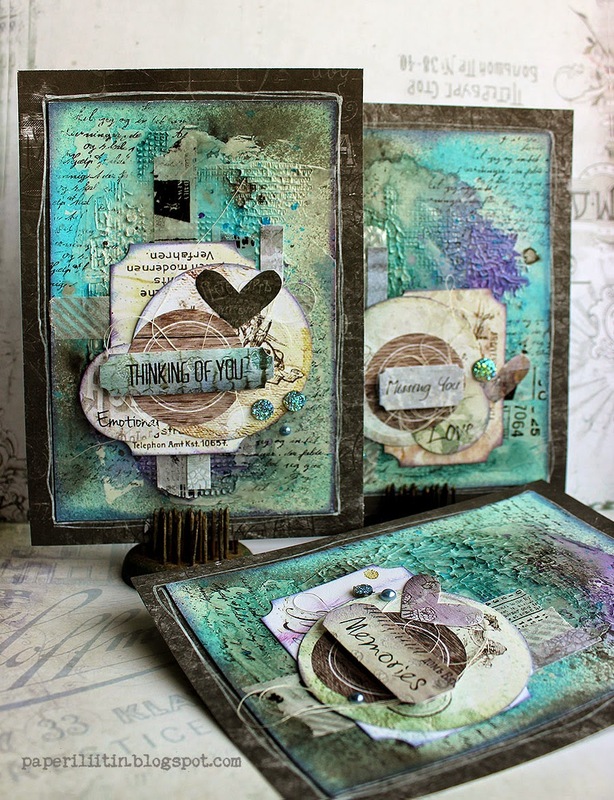 We are in awe of your collage stamping skills! 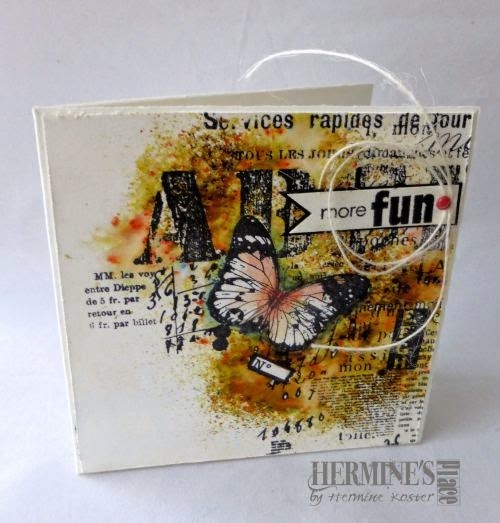 Hermine will win a Guest Designer slot, a Winners Profile and of course her gorgeous card will be published in Craft Stamper Magazine. 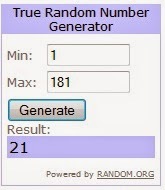 Congratulations Esther, you win the box of goodies! Phew...and we're not finished yet! I suppose that the harlequins are stamped on tissue paper, aren't they? Great idea to stamp half the butterfly with stunning result lovely calm colour combo to. A great tag. Ha Ha I love this little pig – a brilliant card – thank you for making me smile. So...If you made one of the comments listed above, you're a winner! ALL winners need to get in touch with me in order to claim your prize. A link to my email address can be found by clicking my name in the 'posted by' line at the bottom of this blog post. Please check back next Friday for the launch of our February Challenge, we can't wait to see what you create! 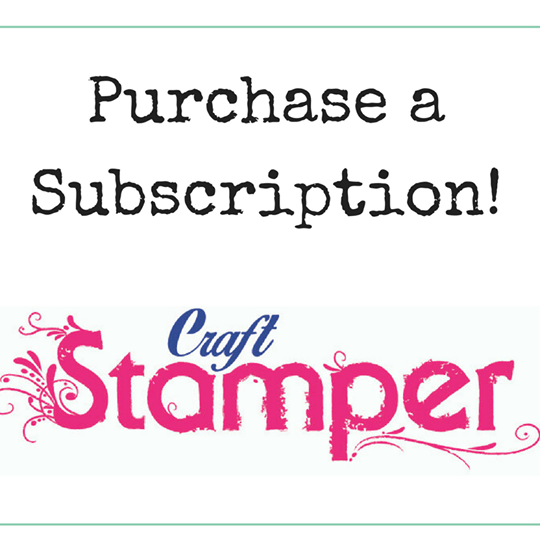 Hi there Craft Stampers! 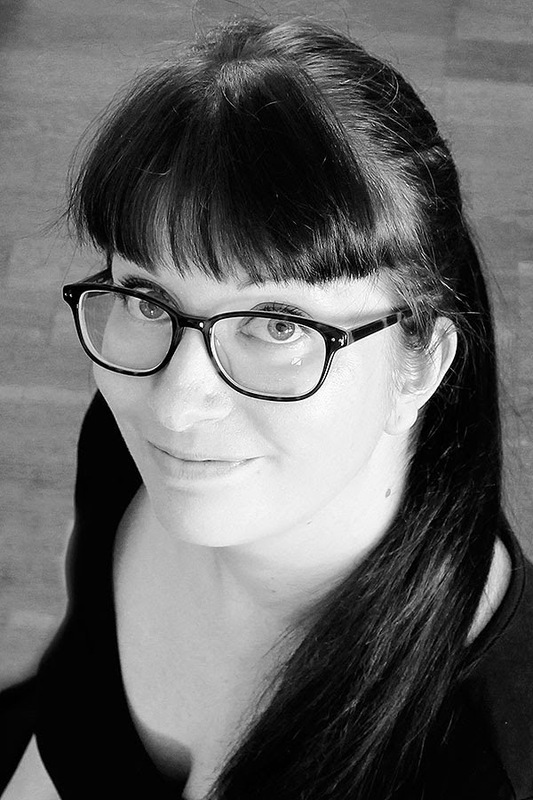 My name is Riikka Kovasin and I'm from Helsinki, Finland. I'm married to the love of my life and we have two daughters together, aged 5 and 4. I joined the CS team little over a year ago, in November 2013 and have been creating for the magazine ever since. I was originally a part of the Scrap365 design team and then got asked to contribute to CS as well. Like most crafty people, I assume, I've been doing different kinds of things my whole life. Paper crafts, sewing, knitting, painting... It took me a while to really find my favorite supplies but after my first daughter was born I got into scrapbooking and fell in love with all sorts of paper crafts. I had used stamps before in card making and still do occasionally, but my favorite way to use stamps is to create a background using them and layer them on top of each other. My "go to" ink is Archival Ink in either Jet Black or in my new favorite, Watering Can. I chose this project for many reasons. It has many of my favorite supplies in it, a stamp that I absolutely adore but I guess the main reason was the topic as it's a turning point in my life. Long story short, it's about a moment when I learned I was a crafter, a maker and followed my passion in my studies. A: I'm a mixed media influenced crafter so I absolutely love to get messy! I adore mists, gessos and inks and layer them on the same piece. I tend to use analogous or even monochromatic color scheme in my projects and simply adore people who can join opposite colors to the same craft. I guess my favorite technique would include a pencil. It's not as much a technique than a little thing I usually do in my projects - add loosely drawn pencil circle around the focal point. This piece shows my love to layer. In this card there's acrylic paints, mists, PanPastels and inks. I love when I can get messy and just try out different mediums. On top I layered some epoxy butterflies, painted over them with gesso and then wiped the shapes clean again. This was so fun to make! A: Everywhere! Or maybe rather "nowhere" as I usually do not tend to look for any inspiration but let it find me. And it usually does find me and I end up in a situation with "more ideas than time". But anything can inspire. It can be a color combination, a texture I've seen, a new supply that just needs to be tested or when I have a certain assignment to fulfill. You can find inspiration in the works of others or from your own creations! Inspiration is actually a thing that really intrigues me and I've been writing a series of blog posts about the different sources I've used and am using (you can see the posts here). I also have an ongoing challenge together with Marsha Valk called "Inspired By" that also may shine some light on the process and how I draw inspiration before starting a piece (those challenges are here). I chose these cards as my third favorite as they show my love for the different mediums but also as they represent my favorite color palette. Like the first project they also have some of my favorite mediums and brands in them and as a little treat, these come up with a tutorial, too! You can see it here. Thank you so much for letting me to share a few words and some of my favorite projects here at Craft Stamper blog! If you wish to visit me, my blog is called Paperiliitin (Finnish word meaning paper clip) and I also have several social media accounts. It would be fun to see you around! Wishing you all a pleasant day! 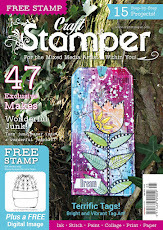 Many thanks to Riikka for sharing a little of her stamping story and some beautiful projects and thanks to you for joining us today, we hope you're enjoying finding out a bit more about some of the designers! Welcome to our very first Winners Profile, showcasing the Design Winner of our last Blog Challenge! A: I have been a stamper for over 19 years. All started with a little craft shop near my home village. There´s where I first saw rubber stamps. Instantly I was hooked. A: I love wood mounted rubber stamps but had to switch to polymer or cling mount stamps since these don´t require not so much storing space. I have a huge collection of stamps from many manufacturers but Stampers Anonymous, Hero Arts and Waltzing Mouse Stamps are represented the most. A: CAS is nothing I can do. It always looks so empty ;-) I love detail, layers and various textures - nothing better than trying out some "new" techniques. A: Creating Albums out of old package carton or something is my all time favourite! I like to build something out of nothing. I just love reading about another crafter and getting to know them a little, don't you?! Congratulations on being our December Design Winner Martina, and it was lovely to learn a little more about you! Our current challenge 'Take A Stamp' is still open for a few more days! All the details can be found HERE. Don't forget about our Blog Hop, that is also open for comments for a little while longer! Details on the blog hop can be found HERE. See you next Friday for the HUGE reveal of all our January Winners! Take It Make It January Challenge : Inspiration Blog Hop! I'm so excited to announce the start of the very first Take It, Make It Blog Hop! As part of the big 2015 relaunch of the new look challenge, we thought we'd have a bit more fun with a blog hop! AND.... as if the main prize wasn't enough, we've only gone and rustled up some more for the blog hop! How's that for a super fabulous mixed media substrate pack?! The BEST thing is.....we have 12 of these packs to give away, one up for grabs on each and every blog along the hop! You can also bag yourself some amazing original artwork too, each blogger has generously given the project they are showcasing on the hop as part of the prize! When the main challenge ends, we will also be closing the comments on each blog post along the hop. We will then draw 12 names at random.... one from each set of comments on each of the 12 blogs. If your name is chosen from the comments on Elizabeth's blog (for example), you will win a substrate pack AND Elizabeth's artwork, the winner chosen from Shirleys blog will win a substrate pack AND Shirley's artwork and so on and so forth! So, without any more waffling, here is the blog hop list! I have been reliably informed (!) that there is some stunning eye candy to look at (and to be won!) along the hop...so what are you waiting for? And then, when you're all finished...don't forget to get your own stamps out and enter the main challenge! All the details for the main challenge can be found HERE. All 12 winners from the hop, and also the Design Winner and Prize Winner from the main January Challenge will be announced here 9am GMT 30/01/15. Take It Make It Challenge: All New For 2015! Take It, Make It December Challenge: The Winner!